This kit will convert your Pre-2015 GMA-FC-100 or 200 Forward control foot shift shaft assembly into the new splined shift shaft design. Eliminating the old "D" shift shaft, cam & shifter arm. "Read all instructions before you begin the Retro Fit Kit installation procedures. First you will need to have a drill or drill press, A 13/16" or .8125 drill bit, Red & Blue Thread Locker of some sort, Assembly lube of some kind, An Arbor press and your basic hand tools. 1. Support motorcycle on Safe and Secure jack or stand, Secure and Safe enough for you to remove the left side forward control assembly and kickstand assembly. 3. Remove kick stand assembly, and left front foot peg, and safely set aside. 4. Remove left side of GMA-FC-100 forward control assembly from left side of motorcycle for disassembly, Or you may choose to do most of the following disassembly while left side of forward control is still mounted to motorcycle. 5. 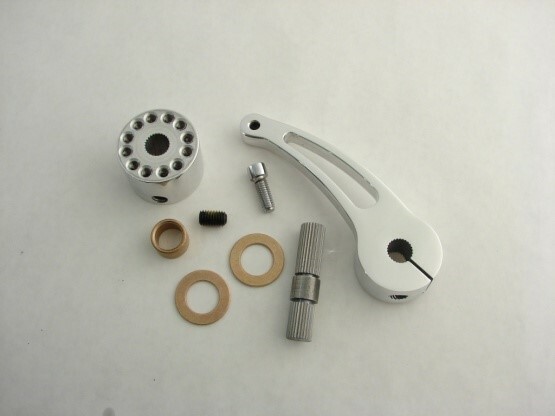 Remove the foot shift arm beauty cap "unscrews" standard thread, from foot shifter lever, and safely set aside. 6. Remove the (3) Allen screws "SHCS" and the foot shift lever, and safely set aside. 7. Loosen the (2) set screws, (1) from the shifter cam and (1) from the shifter arm. 8. Remove the shift arm and shift cam along with both thrust washers, Remove the "D" shift shaft from forward control mounting plate, You will not reuse D pin. Remove mounting plate at this time, If still mounted to motorcycle frame. 9. Carefully press out the shift shaft bushing from the forward control mounting plate, You will not reuse bushing. 10. With an 13/16" /.8125 drill bit and drill press or drill enlarge current bushing hole to accept new shift shaft bushing, Measure supplied bushing and drill bit to verify that the drill will not drill too large of a hole, Deburr hole after drilling. 11. Press new supplied bushing into newly enlarged hole, You may use red or green thread locker to retain bushing if bushing fits loosely in new hole. 12. Apply red thread locker to splines in new shift cam and on the longer side of new splined shift shaft, and insert the long splined side of new shift shaft into new counter bored side of splined shift cam leaving approximately 1/16" gap from being flush "Recessed 1/16" from the drilled and taped face of new shift shaft cam. You made need to use an Arbor press to press splined shaft into new splined shift cam. 13. Remount shift side forward control mounting plate to the motorcycle, using red thread locker for mounting bolts to frame and torque to spec. 25-30 FT.LBS. 14. Apply a light coat of assembly lube to the I.D. of new bushing, thrust washer and thrust washer counter bore in new shift shaft cam, and insert assembly into the new bushing in the forward control mounting plate. 15. Apply a thin coat of assembly lube to the second thrust washer, and counter bore of shift arm. 16. Reinstall front foot peg assembly. 17. Apply a blue thread locker to the shift arm pinch bolt and insert into shift arm, Index foot shift lever to desired height and install shift arm onto open end of splined shift shaft, with thrust washer facing in towards the mounting plate, Raise shift linkage to verify foot shifter height and shift linkage connection, Readjust shift arm on splines as needed to foot shifter desired height, Pinch or clamp shift cam and shift arm to desired tension for ease of foot shifter movement, "small speed clamp works fine for this". Verify that bushings are still seated in counter bores. 18. Torque pinch bolt spec. 16-20 FT.LBS. 20. Verify that all work is correct and complete, And has been tightened to correct torque specifications. 21. Lower motorcycle onto ground and test shifter height is correct for your riding comfort, Recheck all work, Let the thread locker cure as per thread locker manufacturers time limits, Usually 24 hours, Before you ride motorcycle. For Later versions GMA-FC-RFK, BDL does not supply, or do you use 3/8"-16 set screw in shift cam. Belt Drives Ltd. For assistance you can E-Mail: tech@beltdrives.com with your questions.